Joshua Nowicki, a Michigan photographer, and his wife had a rather unexpected surprise this Valentine’s Day weekend when they planned a stroll along the shores of Lake Michigan. Blasts of arctic wind and snow forced them to postpone their walk until the next day, but in the end, the conditions actually proved somewhat favorable – for reasons he captured pretty well with his camera. “On Valentines Day my wife and I had been intending to go out dinner but due to the blizzard condition that day, we decided to post-pone our evening out until Sunday,” he said to News 10 of Detroit. When they finally did go for their walk along the frozen sand, the landscape was rather different than he had anticipated. Instead of the traditional shots of a beach and lighthouse landscape at dusk that Nowicki had originally hoped for, he saw something else – what appeared to be intricately constructed mounds jutting out of the frozen sand all along the beach – what appeared to be the lost remains of a forgotten civilization. Nowicki momentarily felt like the farmers who first discovered the hidden remains of Pompeii centuries after it was covered by ash. 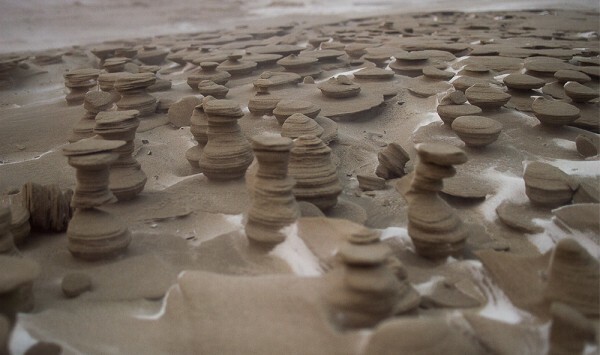 Overnight, carefully constructed monuments appeared to be rising out of the sand. The tower formations are similar to the Hoodoo columns found along the Colorado Plateau in Utah, which formed due to erosion from the glaciers melting after the last Ice Age.